On more than one occasion, my friend over at Freedomborn has reminded me of an apparent paradox that plagues the Christian faith. Briefly stated, there is one Holy Spirit who the Bible declares will bring believers into the truth of God’s Word… one truth. And yet, look around. There’s an un-realistic number of different interpretations available for the believer to choose from. Why? Forget I asked ‘why’ for a moment. Before I pose my question, let me first stress that I’m not insinuating that there are multiple means of salvation (or even multiple interpretations of any passage or doctrine). I contend the Bible declares we are saved by grace through faith in the finished work of Jesus Christ alone… period. But then the Bible anticipates the child of God to grow in the grace and knowledge of Jesus Christ. That’s where it gets hairy. That’s where the undefinable number of interpretations begin. Consider baptism, the Lord’s Supper (of which the correct title is even argued), the security of the believer’s salvation, the Sabbath, and the sanctifying work of the Holy Spirit, just to name a couple (but, as I stated, the list seems endless). Recently, I read a series of posts from Jim’s site, ‘Not For Itching Ears,’ that begs an answer to the question, “Is Scripture alone sufficient (Sola Scriptura)?” And then, can believers properly interpret the Bible without the Church’s guidance? If not, which denomination (Church) has properly interpreted the Scriptures? The contributor of the article makes his arguments for a particular Church, and insists that Scripture alone, without the guidance of the Church, is insufficient and provides ample opportunity for inaccurate interpretations. I’m so intrigued (possibly disturbed) by the thought pattern from this article that I couldn’t help but present this to my reader(s). 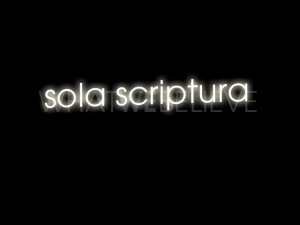 As a note, I have personally taken an affirmative stance on the position of ‘Sola Scriptura’. But who am I? I look forward to responses (please)… of any nature. Help! This entry was posted in WordPosts and tagged Bible, Christianity, church, doctrine, faith, Jesus, Scripture alone, Sola Scriptura, sufficient. Bookmark the permalink. 28 Responses to Sufficient… or Not? Mike, I wonder if you might give me permission to post this to my site as a guest blog. Of course I would give you credit for writing it and post a link back to your blog. I might even place you on my blog roll? I write a devotionals blog at http://stevensawyer.wordpress.com. You might enjoy reading some of my stuff, and I’d like to invite you to subscribe while you’re there. I know I’m going to enjoy reading more of your stuff. Thanks. Hi Steven. Thanks so much for swinging through. By all means you’re welcome to these words. I also plan to travel over your way and check it out. God bless. I agree with 100 percent! I believe the Bible is the inerrant word of God from cover to cover. I believe it passionately. In fact, when I taught adult Bible studies at my church I used to tell my students, “Don’t believe a word I say.” I told them to go home after class and open God’s word to read for themselves what God had to say to THEM SPECIFICALLY about the topic we were discussing in class. God’s Holy Word is all anyone needs to discover and apply God’s truth for themselves. Having said that, of course it’s possible for someone to take His Word out of context and ply it to their own Scriptural ignorance. I wrote a blog about that very thing on my site you might enjoy reading: http://bit.ly/vIQKnm. I enjoy reading your blog. I will follow you now. I invite you to read the link I included above, then consider subscribing to my blog. I would love to share our mutual love for the Lord. If you’d like to contact me by email you can reach me at: stevesaw@gmail.com. Again, thanks for sharing. Great thoughts. I was trying to comment on Second Chances post. The words I was expecting Max to highlight were not “and Peter” but “He goes before you.” Those are the jewels (to me) in that particular verse (except of course ALL WORDS in verses are jewels!). To think Jesus goes before us all the time in all situations! Wow. Anyway, I wanted to add that there but couldn’t. Too late I guess. Sorry not Timothy but the missing book of Thomas although I think this was more accepted by word of mouth and mentioned in other writings at that time. One thing to keep in mind, too, is that different denominations have different Bibles- the Catholics have more books in the Bible than the Protestants, whose OT mirrors Judaism… and then there is the Ethiopian Bible, which has even more. Theology. Good stuff, there. It continues to surprise me the number of people who are warming the pews without having a clue what the church they are attending believes…. Hi Mike, as loopyloo305 said some people have never even seen the Scriptuers so how do they grow, The Bible reveles God… if we look at this Scripture below again it gives us the answer but we also need to remember that God said no one will have an excuse because He is revealed in Creation I’m sure you didn’t create Pot Pie Possum only God can create life. 1 Corinthians 2 ( 9 – 16 ) But as it is written, Eye hath not seen, nor ear heard, neither have entered into the heart of man, the things which God hath prepared for them that Love him. But God hath revealed them unto us by His Spirit: for the Spirit searched all things, yea, the deep things of God. For what man knoweth the things of a man, save the spirit of man which is in him? even so the things of God knoweth no man, but the Spirit of God. Now we have received, not the spirit of the world, but the Spirit which is of God; that we might know the things that are freely given to us of God. Which things also we speak, not in the words which man’s wisdom teacheth, but which the Holy Ghost Teacheth; comparing spiritual things with Spiritual. But the natural man receiveth not the things of the Spirit of God: for they are foolishness unto him: neither can he know them, because they are Spiritually discerned. But he that is Spiritual judgeth all things, yet he himself is judged of no man. For who hath known the mind of the Lord, that he may instruct Him? but we have the mind of Christ. Hi TikkTok, yes so True what you say but regardless of the Translation there is only one Truth and that is God’s as revealed to us by our only Teacher Jesus Christ, The Living Word, through the empowering of The Holy Spirit who is part of The Trinity or as They were known before The Godhead. Regardless of what any Church Teaches we are to test their sprit, such as if a Church teaches that God does evil for any reason or it is ok for us to, then we reject it. There were also other books referred to in the Scriptures that were not canonised ie Jasher and Timothy but were claimed to be Truth. Some of the ones you mentioned TikkTok that were Canonised were later found to be more Mythological then Truth and we know this because they are not confirmed by the rest of the accepted Scriptures, and so some Churches reject them. The Holy Spirit plants seeds everywhere and they will bear fruit when revealed by The Light. I finally read most of the article, which I hadn’t read before, and the one thing I have to say is that the things of the Bible is a mystery, and it is something for us to discover for God’s ways are higher than man’s and His thoughts higher than man’s. While we have the Holy Spirit to interpret Scripture, and the Body of Christ, God did this purposely to find a way to search for Him and to seek Him, and we don’t need only the WORD to get a rhema, but when you are believing for promises and you are believing for something, the WORD brings promises and power. We are not to be caught up in philosophical discussions. The WORD of God is our primary source for revelation of Jesus Christ, but as for sufficiency, He said, “My grace is sufficient.” Remember that faith is a journey and a discovery process. The Protestant Reformation had it’s values, and if you watch the last video I posted “He gave gifts unto men,” the speaker gets into that, but traditionally we are to understand the Hebraic roots, (that doesn’t mean becoming religious) but we can still trust the WORD of God, because everything else has a form of godliness, but denying it’s power. As I shared singingsinglev4 Jesus is The Living Word of God and as He warned …you can study the Scriptures all you want but unless you come to Me which the Scriptures declare lound and clear you will never know God because I Am the only way to The Father and the Scriptures tell us how we find out about Him is clearly reveled to us in in the Scriptures below…I never get caught up in philosophical discussions, every thing I share is reaveled to me by our only Teacher Jesus Christ, The Living Word and is confirmed in God’s inspired written word but without the empowering of the Holy Spirit as you can see below we can’t understand the written word and this applies to any Church regardless of what they call themselves. 1 Corinthians 2 ( 9 – 16 ) But as it is written, Eye hath not seen, nor ear heard, neither have entered into the heart of man, the things which God hath prepared for them that Love him. But God hath revealed them unto us by His Spirit: for the Spirit searcheth all things, yea, the deep things of God. For what man knoweth the things of a man, save the spirit of man which is in him? even so the things of God knoweth no man, but the Spirit of God. Now we have received, not the spirit of the world, but the Spirit which is of God; that we might know the things that are freely given to us of God. Which things also we speak, not in the words which man’s wisdom teacheth, but which the Holy Ghost Teacheth; comparing spiritual things with Spiritual. But the natural man receiveth not the things of the Spirit of God: for they are foolishness unto him: neither can he know them, because they are Spiritually discerned. But he that is Spiritual judgeth all things, yet he himself is judged of no man. For who hath known the mind of the Lord, that he may instruct Him? but we have the mind of Christ. In Mark 4 it talks about the sower and the seed. The seed is the Word of God and the sower is whoever sows the Word. If the Word alone was enough, then Jesus wouldn’t have established a church, and the Early Church Fathers, wouldn’t have mentioned elders, bishops, deacons, and other members of the congregation. Everything is established on the basis of two or three witnesses so there would have to be some basis of agreement on things as not to lead into error. Remember the Word alone is nothing without the Holy Spirit, and the Holy Spirit is what links the body of Christ together. We are to be in fellowship together. As far as, which denomination has the right interpretation can create an error in thinking because – it is the whole Body of Christ, whether it be Charismatic, Pentecostal, Baptist, Lutheran, Methodist, etc. The Bible says we must believe that Jesus Christ is the Son of God to be of God. It is important to take the whole counsel of God, so my preference would be Full Gospel because they take into consideration the whole counsel of God not leaving anything out. But there is something to be said for the personal individual relationship you have with the LORD, which is Sola Scriptura. It’s just like a brain must send signals to each body part, and the whole body has to work as a team to get anything done. I hope that answers your question. Hi singingsinglev4, I hope it is ok with Mike if I share with you first, your comment brought a response from me. Jesus as we know is the Living Word He is The Way The Truth and The Life, unless a persons heart is prepared the seed will not take root.The Body of Christ is indeed very important but Jesus is The Head and our Authority we are not but we are His hands, arms, feet and voice we are to Love uncondionally, support, encourage, and build up each other, even cry with each other and rejoice , worship, and be thankful in Unity having the same mind and purpose and we also to reach out to a hurting world offering Hope in Christ Jesus but as you said it is not just one Church as Revelation shows us and other Prophesy. It is all those who have come to real heart repentance and they will be from every Tribe and Nation all over the world and this includes differant Denominations and house Churches even some will be rescued from Cults , all those who believe wholeheartedly and live there lives 100% for the Lord in other words Love Him and others with all their hearts and are obedient by the empowering of The Holy Spirit., He has planted the seeds of God’s Truth everywhere which Glorify The Lord, God will build His Church and rise it up to be Victorious in… other words we will soar! Thank you for listening singingsinglev4 – Christian Love Anne. Mike I have no objections to what you have shared it is what I have been saying from the start, I rejoice that the Lord is leading you to understanding in this regard, it is what He showed me with Freedom in Christ Jesus, we must go back to the early Church we lost the Truth along the way, also Satan has planted lies and people who have been deceived have continued to teach error as have the Cults but mostly it is man’s fleshy pride in not coming humbly to God and seeking His wisdom. Mike I want to commend you on your humility and on your searching heart. It is very True we only preach half the Gospel today but the rest is all there, although as I keep highlighting without God’s wisdom we won’t understand it nor will any Church, my post on gaining wisdom explains why, I will post the link below as my search is not working …what’s new. Mike you have no idea how much Joy I have in what you are sharing if properly understood it is the answer to so many prayers from Christians all over the World … no their not exactly sure what they are praying for and about but The Spirit is leading them they are God’s prayer Intercessors and He knows, I pray that He rises them up daily, please join me in this, there is great power in believing Prayer, in believing our God is Love and wants to help us find our way back as the Prophesy in Revelation reveals, the Church needs to come to heart repentance and be Born again of God’s seed and then we will rise up on wings like eagles and soar, instead of scratching around in chook pens.. Yes, I agree Anne. The traditions of men are often of no value to the faith. But these are not the traditions that are being discussed in the article at Jim’s site. The author is referring to Church Tradition established through the teaching of Jesus, to His disciples, who in turn made more disciples, and so on. We have documented records of these who were taught by the Apostles themselves. Today, there are so many different denominations teaching so many different things, that we, the professed Church, can’t help but look ridiculous to those without. Take for example, baptism. How can so many people come up with so many different interpretations for the proper method of baptism and its meaning, purpose? Quite simply, because ‘Scripture alone’ leaves room for these interpretations, without the guided influence of the Church. What I mean is, if you hand me the Bible, and tell me to define baptism by its teaching, I’m going to respond with whatever denomination’s influence I’m affiliated with. But if you travel to the next ten churches down the road, you may possibly be given ten different answers than mine. So how can the problem be eliminated? The author of the article argues we need merely go back to the teachings of the Church in its younger state. Read and learn what believers practiced then. It’s available, we have just forgotten they once lived. The believers I’m referring to are those taught by the Apostles, and then they taught others, and so on. But somewhere, someone decided they could interpret Scripture for them-self against and without the guidance of the Church. One doctrine was changed a little here, then another one there, until now, well… it’s obvious, we have a mess. I mention Luther and Calvin, because there is of course a time and place when doctrine has been blatantly marred for the purpose of personal or corporate gain, and someone must be the Berean. However, if (using baptism once again) the Church teaches a method and purpose, and it aligns with Scripture (even when it is unclear in Scripture), does an individual have the right to question or change what has been established from the foundation of the Church? Please take the time to read the article at Jim’s place (linked in post). It is lengthy, but so much more is said there than I can possibly place in a response. Hi Mike, I thought I would jump in here, as you and I have been commenting on my site about this very thing. I wonder how many of those commenting actually took time to read the arguments presented by The Eastern Orthodox church? It seems obvious to me that many didn’t read it. I don’t say that in an accusatory way at all. It just seems that way. My normal reaction to the sola scriptura argument was always to say “Of course!” Duh!. Then I read the same article that you read. And I read the whole thing, then I re-read it, all four parts. I had never heard anyone talk like this and the scary part, at least for me, was that the argument was so compelling. Like you, Mike, I have spend countless hours now, researching this out. I think it would do every protestant of all persuasions, to read that article and to understand where the EO church is coming from. They can trace themeselves back to the Apostles, and they have the documents and history to back this up. We, therefore, have coe from them. To reject their understanding of our faith without even knowing what it is we reject, seems dangerous. At least that’s my take on it. Jim, Thanks for jumping in. I hope many will take advantage of reading the 4-part article. It is eye-opening, and should at least be given the opportunity of expression. I fear many are like me, and simply have no idea that the word we often condemn, tradition, is actually necessary if we are to understand many of the truths that are debated so often today. I have come to believe, that just as God commanded Israel to teach their children everything He had done, so the Church must once again learn of its history (all the way back to the Apostles) and ensure future generations never neglect to do so again, as we have done. I was literally blown away to find documentation has been preserved (in massive quantities) of the entire history of the Church, Jesus is still building. I know, we must be careful. Just as today, cults were prevalent from the beginning. But with a little effort (especially for our generation), we can easily find the letters of the Ante- (I know, I spelled that wrong at your place) Nicene Fathers (these are those that were discipled by the Apostles themselves, and then made new disciples) and walk through the entire history of Jesus’ Body here on earth. Back to that word, tradition. This is good tradition! This is the tradition that Luther and Calvin insisted was beneficial. Calvin even went as far as to say that for the first 600 years of Church history, the true Body managed to function in very pure form. One Church, not a gazillion different denominations all claiming they have the truth. This is tradition established by the Body of Christ (from the Word, and from word of mouth passed down starting with Jesus, going through the Apostles, and then generation after generation of disciples), and taught to the members of the Body. Thanks for sharing this article, Jim. And to the readers, if you haven’t had time to visit his post yet, take the time to go there and read… you will not be disappointed. Alarmed maybe, but not disappointed. Hi Mike just a few questions that I would appreciate your understanding on but in regard to tradition as the Scriptures tell us it is not all good, if it’s only outward then it’s fruitless, the same as if you are Baptised and there is no heart repentance, it’s like having a bath without soap. Mark 7: 9 And he said unto them, Full well ye reject the commandment of God, that ye may keep your own tradition. Mike do you believe God does evil or do you believe babies and little Children go to hell if they haven’t been Christened and do you believe that God chooses you according to His will regardless of your heart repentance. All these were taught to me as being part of Calvin’s teachings and not one is confirmed in the Scriptures please advise if you believe me to be taught and if not in error and the Scriptures that confirm these teachings. The Saints in Heaven today never held a Bible in their hands, much less all the reference tools and commentaries…. This statement is True but they did have Paul’s Letters and eyewitnesses accounts even if the Bible had not yet been compiled, they also as we can see in the Scriptures walked in Love by the empowering of The Holy Spirit and they also had the mind of Christ, Jesus is our only Teacher, even if God does use the foolishness of preaching etc but it is His Truth that has the power not man’s interpretation or understanding. Thanks Mike – Christian Love Anne. Hi Mike thank you for sharing there was much Truth in what you said …but can I just reasure you, having been many times in quicksand, we can indeed survive if we have a rope and Jesus our only Teacher is the rope, His cords of Love never let us sink. In response to your statement Mike…..A couple of thoughts to consider. 2 Peter 1:20, 21 – Peter declared the Holy Spirit moved men to write Scripture, therefore only the Holy Spirit can give men the meaning for the text. (it’s His, and it is foolishness to those who are perishing)…. as you can see below Mike Sola Scriptura is confirmed in the Scriptures and also the rest of your statment. So does God speak through The Body of Christ… we are given gifts to build up the Body we are Christ’s hands, arms feet, voice but He is our Authority in all things and it is His Truth we are to share not man’s … how do we know if we have His Truth we ask for God’s wisdom, we believe we have received it and we give thanks for it as we walk and grow in it and we Trust The Scriptures for confirmation they are all inspired by God and we will understand them as Mike shared and the Scriptuers confirm if we are empowered by The Holy Spirit so we do not need man’s fleshy understanding reasoning or logic. What about Translation errors and how do we know if there is error, God will show us. We will also be lead into more knowelage and insight of God’s Truth as we mature and are perfected in Love. I tend to agree that scripture alone is not sufficient. We are called to fellowship; and in that fellowship, we are presented with different views of the same scripture. God the Holy Spirit speaks both through His Word and through the words of other Christians. Ultimately, we must come back to the Word; this is true but studying other people’s deep knowledge is always beneficial in correctly interpreting God’s Word. I guess I’m saying that THEOLOGY has much to offer the everyday believer. The more you know…the better you receive truth. Or, so I think… but like Michael says, who am I? Thanks, Carley. If you haven’t had the chance to read Jim’s article (actually someone else’s, he re-posted it), you’ll be pleasantly surprised to find the author agrees. He argues, while it is God’s holy and inspired Word, the Bible wasn’t meant for individuals to simply mull over and come up with interpretations that sounded good to them. The Church, that Jesus is building, is responsible for the handling of the Word (much as Israel was). I agree with you. Being that God has blessed us with a privilege very few, if any, generations has experienced (the availability of the Word), we should take every advantage of it. But the author of the article would question our authority to feel we have interpreted it correctly if it goes against the traditional teaching of the Church. I know, at this stage, someone would argue, hey… what about Luther and many others like him? Luther founded his thesis against obvious heresies that had grown what seemed permanent roots in a particular denomination. I’m late offering it, but Happy Thanksgiving to you and to all. God Bless. As stated by Patricia, we are a fortunate generation. The largest majority of the Saints in Heaven today never held a Bible in their hands, much less all the reference tools and commentaries. Does this add to the argument for the Church’s responsibility to ensure Scripture is interpreted correctly? Anne is very correct in her assessment that Scripture can’t have multiple meanings. (we shouldn’t agree to disagree, that means we have given up on knowing the truth) We may be able to apply the teaching in different areas of our lives, but the Holy Spirit gave one message and that’s the message we need to hear. Ah, and Mrs. C gives wonderful input from an era that produced great men of the faith who wanted exactly what Anne is claiming, for men to know the truth, personally. Interestingly, the Church from the article firmly supported Luther’s movement. But they felt he should have joined their ranks, not begin the protestant reformation. They have no use for any of his following, especially Calvin. Still, I must agree with Bob and April. There is a right way to present the truth. There is also a time to be open-minded enough to at least give another the time of day when considering their stance. I, for one, am often guilty of displaying pride in my personal beliefs about the disputed texts. Thanks again for the great comments, I think this is an area where believers need to be human enough to admit we’re still growing in the knowledge and grace of our Lord and Savior, Jesus Christ. Hi Mike I guess you have put me on the spot but then you have offered to let me share what is in my heart, I do so with the anointing of the Lord and under His ultimate Authority. I do not believe a Woman should have Authority over Men or teach them in her own Authority. Men were created to be in Leadership and Woman to be their Helpmates, physically, mentally, emotionally and spiritually, in Christ Jesus, I submit to the Authority He has given Men because of my Love for Him and I obey them as they are faithful to walk as He walked through His empowering, the only exception is if an unbelieving husband asked his wife to do something that violates God’s guidelines, a woman does not have to submit. As Woman like Men we are called to share God’s Truth under Authority, to rebuke, to correct error, and to warn when others are in danger because of their sin and we are to do so with Love and for Love and until we are perfected in Love with caution but we are not to depend on worldly/fleshy understanding but on God’s wisdom. Mike I respect you as my Authority on your Blog and will seek to answer what you have asked by the leading of The Holy Spirit but I do not intend to argue with anyone, if they want to reason then I am willing to do this, but it will be in answer to the questions you ask.I will be back later in response to this one and the Statement you claimed I made. I appreciate your comments on this blog…I think your comments do a good job in defining the issue which is an important part of coming to a conclusion. I ,like you,believe that there are parts in the bible that are clear in their definition and I really don’t feel that there is much room for debate. There are Scriptures that are personal for an individual just as their relationship with Christ is personal. God meets each one of us of where we are and we are ALL in different places and different parts of our walk. There are also Scriptures that are open for interpretation, hence, the need is there for us as Christians to be a part of a small group or bible study to learn together more about the scriptures and their meaning. I have no problem when someone looks at the scripture differently as I do. But, I do have a problem when people display a blatant disrespect for my views just because they don’t fit into their sometimes narrow way of thinking. I always enjoy reading your post and gain a lot from them. Keep up the good thoughts and writing! Also, know that I appreciate your support and encouragement on my blog site. It is in encouraging one another that we help each other in our walk. Taking next few days off from writing to enjoy some good family time. Why do I feel like I am stepping into quicksand answering your question? I believe in the fundamental truths as you stated them. Faith in Jesus is the only means of salvation. I also agree with the Bible Man. How else could we read and learn from a passage one day, and then a few years later get something entirely new out of the same passage? I have seen in my own life that the Holy Spirit leads me to what is appropriate for me at the time, showing me how to apply it to my life. But that leading may change a few years down the road. We are told to not forsake the assembling together, because we can be a blessing to other believers and in return be blessed by them. Yes we learn and are taught at church, but where are the lessons taken from? From God’s Word. Those that cannot get to a church on a regular basis can still grow in their faith and their walk with God by studying diligently and praying unceasingly. As long as we have the necessary faith, belief, acceptance and repentance; as Loopyloo says, God will take care of the rest. Ah, my friend, you pose an excellent question, but you can find the answer in the Bible itself! Scripture is important in our education, but the only things that are really needed are faith, belief, acceptance, and repentance. God will take care of the rest. Many places the scriptures are not even available and in our history there were many who accepted God that never had access to the wonderful tools that we do. If the scriptures were essential, they would be lost would they not? Mike you wrote here “And then, can believers properly interpret the Bible without the Church’s guidance? If not, which denomination (Church) has properly interpreted the Scriptures?” I believe the bible has a PERSONAL message to each reader. I believe it is different for each believer too. 1 John 2:27 says -But the anointing which ye have received of him abideth in you, and YE NEED NOT THAT ANY MAN TEACH YOU: but as the same anointing teacheth you of all things, and is truth, and is no lie, and even as it hath taught you, ye shall abide in him.” I look for practical ways to apply scripture to every day life and I leave the doctrines ect to others. That is the beauty if interpretation to me my friend. You can read the same passages of scriptures that I do and get a different message. And chances are BOTH of our messages will be proper and rightly interpreted. Great topic and post my friend!